The charm and beauty of San Pedro Town, Ambergris Caye has become a magnet which keeps attracting thousands of people every year to the island. From its beaches, and incredible water activities along the second largest barrier reef in the world, to the friendly people and the impeccable hospitality every visitor gets, it’s no wonder our visitors fall in love with La Isla Bonita. 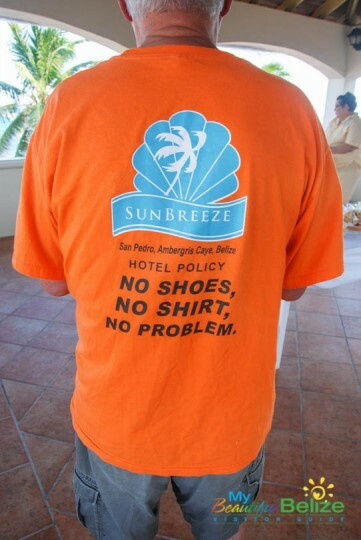 This is the case for 77-year-old Canadian Doug Harris, who has not just travelled to the island for 25 years in a row, but has also been staying at his favorite Sunbreeze Hotel all this time! To commemorate his 25th stay and trip to Ambergris Caye, on Sunday, February 19th, the management and staff of SunBreeze Hotel presented him with a token of appreciation for being a loyal and kind guest at the hotel for a quarter century. General Manager at Sunbreeze Hotel, Julia Edwards prepared a small reunion with some of the staff and Harris on the upper deck of Blue Water Grill Restaurant. During the gathering, Edwards thanked Harris for being an amazing guest for all these past years, and for visiting the island and staying at the hotel each year without fail. Harris thanked Edwards and the staff for their kind gesture before mingling and enjoying some light snacks and refreshments. 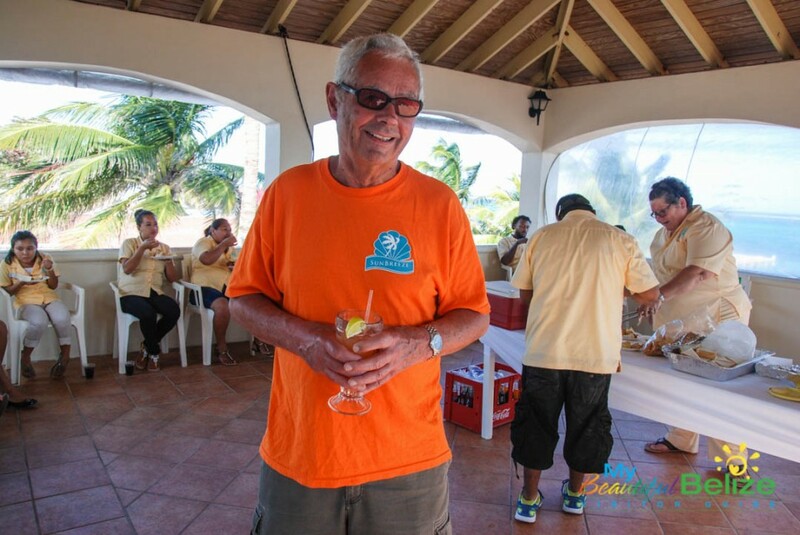 Harris, a retired dentist living in Ontario, Canada first came to Belize via an all-inclusive charter service early in the 1990’s. 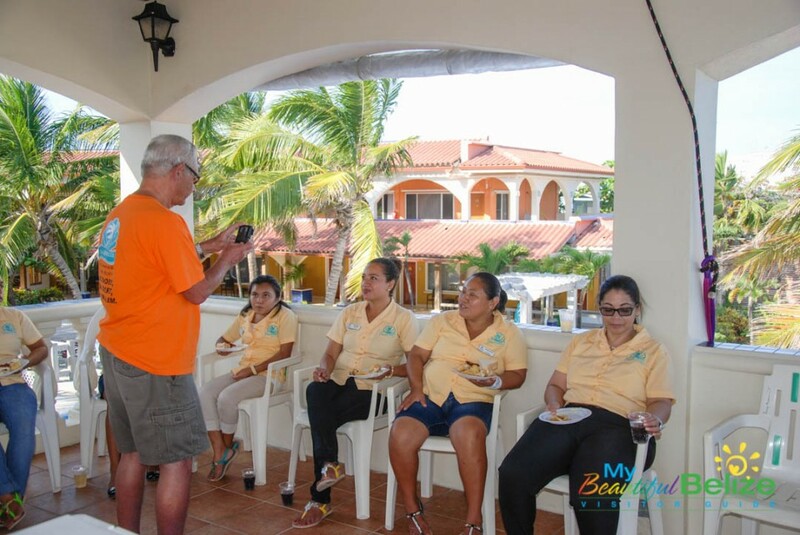 He told The My Beautiful Belize that from his first visit to the country, he was impressed with the beauty and great service of the Belizean people. “These are great people. Belize has the friendliest people in the world,” said Harris. He feels fortunate to have been able to see the evolution of the town and the SunBreeze Hotel, where he is hosted in the same room he stayed in the first time he came to the island. This year, he took advantage of Canadian air carrier Westjet’s direct flight to Belize. Every time he is in Belize, Harris enjoys snorkelling, visiting the mainland, and taking walks on the beach. The big changes the island has gone through are no surprise for him, as he understands that changes must take place. He says this will not stop him from continuing coming to San Pedro. Harris is also a big fan of the annual ‘El Gran Carnaval de San Pedro.’ He always visits the island during carnaval time and was a great friend of the late Felix Ayuso. Harris said that the first he met Ayuso, he was dancing in the comparsas. “He approached my wife and I and began telling us about the tradition of the carnaval and what the dance groups were all about,” said Harris. “Ever since that first time, we became good friends and every year I would look forward to seeing him, not only in the carnaval, but also to spend time having dinner or a drink.” Harris stated that he will miss his good friend Ayuso, and before he leaves the island, he visited the photo exhibit that the San Pedro House of Culture hosted on Friday, February 24th. One of his favourite hobbies is photography and every time he is in Belize he takes tons of pictures which he then posts on his personal website. Harris stated that he loves Belize and as long as he can he will keep coming back for another 25 years of even more.